The same camera technology that automatically recognizes faces and text could help the legally blind read. A new study presented at the American Academy of Ophthalmology’s annual meeting showed that legally blind study participants more than tripled their accuracy in several daily activities involving reading, as well as a few non-reading activities, by using a wearable camera. For the study, participants wore the Orcam MyEye. The camera is mounted on a pair of glasses, and using character-recognition technology, reads the text it views into an earpeice. The same camera can also use facial detection software to tell the wearer who they are looking at. The study followed a dozen legally blind individuals with visual scores of less than 20/200. Participants were asked to take a 10-item test simulating everyday activities such as reading a newspaper or a sign, both with and without the device. The study went on to show that after wearing the device for a week, the participants were able to edge up that score to 9.8. The OrCam MyEye was launched last year, but the study was the first to actually measure how well the device works, albeit with a very low number of participants. Along with using optical character recognition whenever the wearer points to any text, the MyEye can store images of faces, then uses facial recognition to announce any faces it detects into the earpeice. 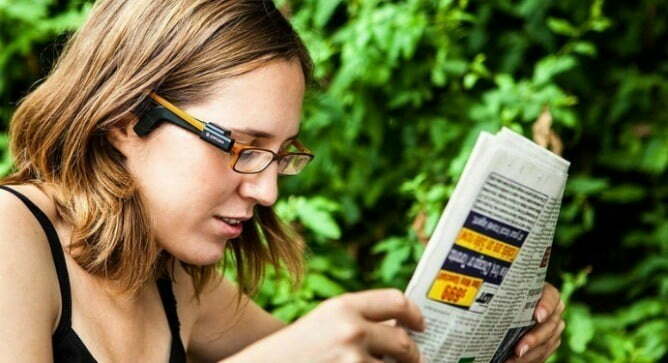 According to OrCam, the device can also be used to help those with disorders like dyslexia. Moisseiev said that additional studies including more participants would help expand the pilot study’s findings.